The Modern Hive "Bait Hive" is a sustainable, elegant solution that makes it easier for us capture swarms. Bait hives are also known as swarm boxes because they're a place for homeless swarms to live temporarily until they are settled into a hive. 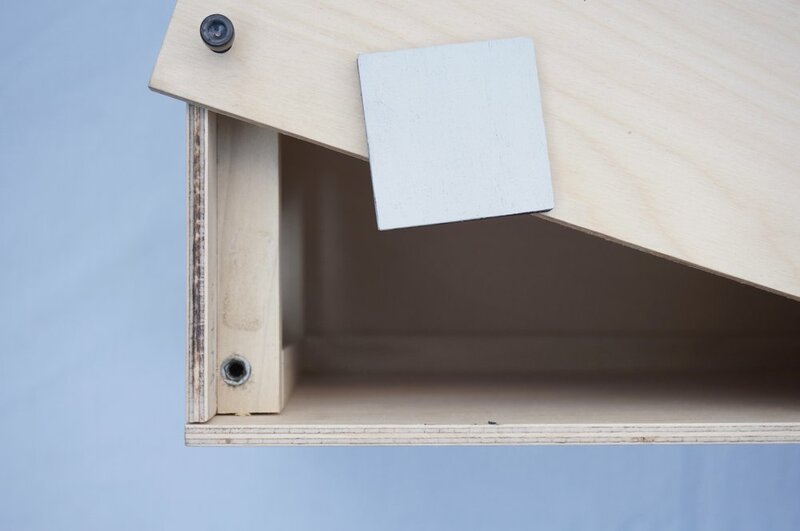 The Modern Bait Hive is designed so beekeepers can tighten down the box without extra tools like power drills, winches, or duct tape. // Lightweight Baltic Birch. Dimensions are 20" D x 10" W x 11.5" H.
// Laser cut 2” entrance and 40L capacity are the ideal dimensions, according to Dr. Thomas Seeley’s research on bait hives at Cornell University. // Screws require no special tools such as power drills. They can be tightened by hand or by using a common hex wrench. 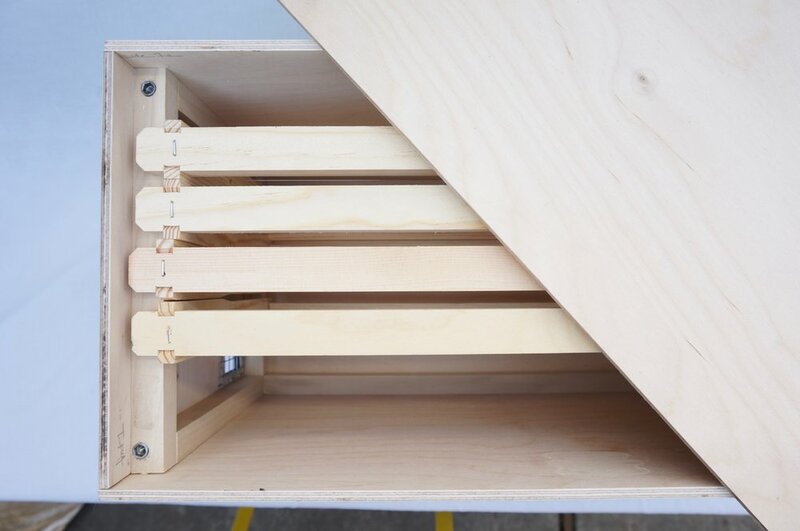 // Cleats hold any type of frame to help bees create comb before they are installed in a permanent hive. You can use Langstroth deep, medium, or super, or Top Bar hive frames. // UV- and water-resistant sealant on the outside means your box lasts season after season. // Non-treated interior is a clean habitat for healthy honeybees. // The more bees use this box, the more attractive it becomes to future swarms. // Galvanized steel, zinc coated 1/2" square mesh allows bees in, but keeps birds and rodents out. // Ventilation holes on the back allow for fresh air. // Bait hives / nucleus boxes are the essential tool for all beginning beekeepers. You'll be using it every season either to catch a swarm or to build a healthy hive. // Includes a Modern Hive leather tag for a keyring or for decor. // Each box is lovingly crafted and unique. 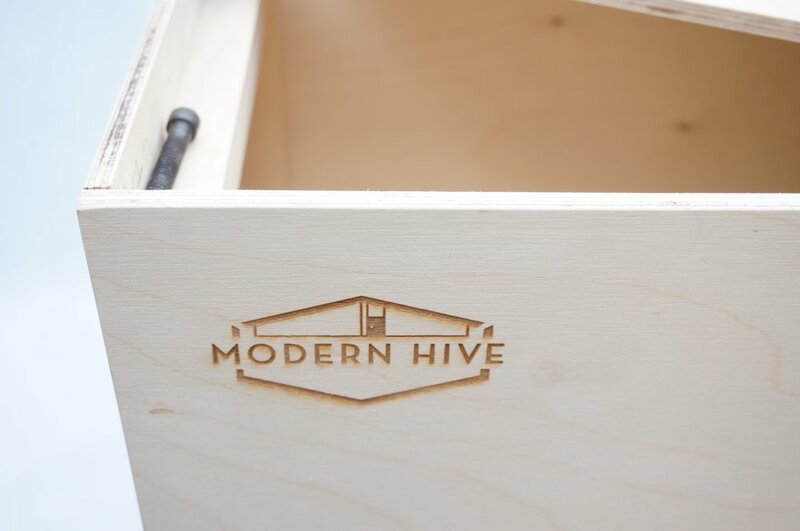 // Hand made and designed in the USA by urban beekeepers. + To help keep an existing hive in your garden or farm during swarm season. + To increase the size of your apiary by using it as a nucleus box to raise new queen bees. + To transport a new colony, or to develop an early / late split. + Show your neighbors you’re a responsible urban beekeeper.